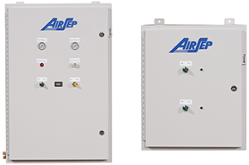 For unique applications, AirSep offers completely self-contained oxygen generators. Equipped with their own air compressors, these generators require no special installation. Simply connect the oxygen outlet to your oxygen distribution system and the power cord to a grounded electrical outlet. Just turn the unit on and set your oxygen delivery flow. All models are available in a variety of electrical configurations and have the ability to deliver up to 95.5% oxygen concentration, -100°F(-73°C) dew point. The Centrox is an oxygen concentrator ideal for use in many applications. The Centrox’s ability to deliver up to 95.5% oxygen concentration at flows of up to 15 LPM (32 SCFH) make it a great fit for medical and commercial applications requiring up to 50 psig (345 kPa). The Reliant is an oxygen concentrator ideal for use in small clinics. 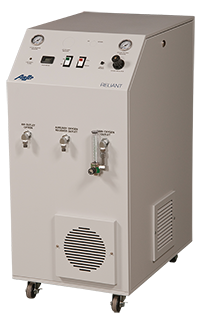 The Reliant’s ability to deliver up to 95.5% oxygen concentration at flows of up to 8 LPM (17 SCFH) make it a great fit for many applications requiring up to 50 psig (345 kPa). An optional module enables the Reliant to supply 8 LPM of compressed, dried, and filtered medical grade air. Under normal operation, the Reliant is toggled between supplying either oxygen or compressed medical air. The presence of an internal oxygen storage tank and an optional auxiliary oxygen receiver, allows the Reliant to temporarily supply oxygen while simultaneously producing medical air. 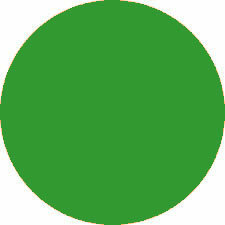 The duration for such dual mode operation is limited by the size of oxygen storage tanks and the oxygen use rate. This simultaneous dual-supply mode enables the Reliant to briefly provide medical grade air without an interruption to the flow of oxygen.